Oh, let all who thirst, let them come to the water. Baptism is the first Sacrament of Initiation. Confirmation and Holy Eucharist are the other two Sacraments of Initiation, constituting another step into full Communion as a Catholic Christian. Baptism is the celebration of a person's new life in Jesus and, consequently, his or her new life in the Church, the faith community, the people of God. When an infant or child is baptized, it is a public proclamation by the parents that they will, in the words of the ceremony, "train the child in the practice of the faith." Baptism is the beginning of that process. The child's Godparents publicly promise to be good models for the child, displaying in an everyday kind of way how to live the Catholic faith. In the situation of an adult being baptized, he or she publicly professes faith in the three persons of the one God, and then renounces sin. 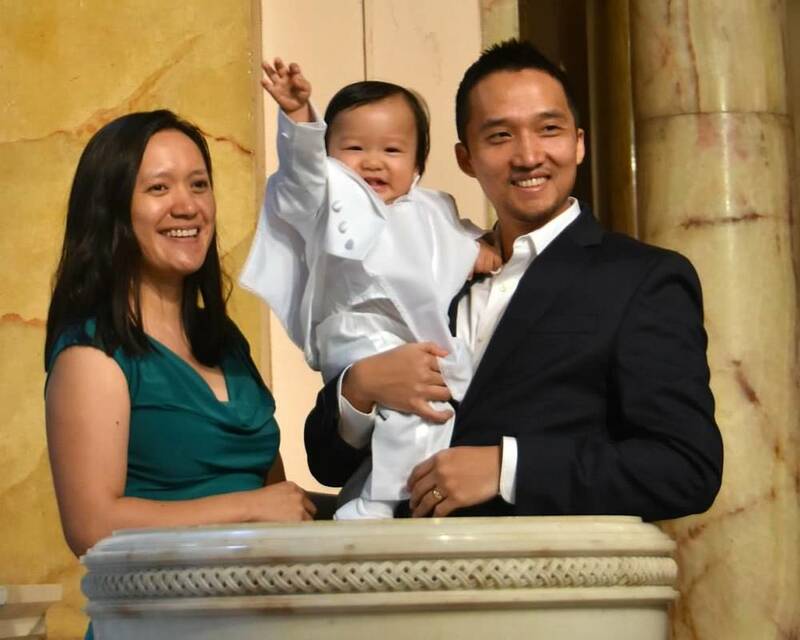 Newly baptized, Jake Kim and his parents, Sungbin & Christina Kim. The Baptismal Rite is rich in symbolism. Water symbolizes the washing away of sin; a candle, lit from the burning Paschal Candle by one of the Godparents, symbolizes sharing in the light of Christ; the white clothing symbolizes being clothed in Christ; and the oil used in anointing the initiate symbolizes sharing in the Priesthood of Jesus and being strengthened by the Holy Spirit to live out the Baptismal promises. At St. Augustine Church, infant and child Baptisms happen at the historical baptismal font, located year-round on the altar, near the Our Mother of Good Council chapel. The beautiful font is carved from marble and was placed in the church during the renovation of the altar in the 1920s. Do you have a child who is ready for Baptism? Most Baptisms are celebrated during a regularly scheduled weekend Mass. Families meet one-on-one with the pastor to prepare for this wonderful occasion. Please contact the Parish Office to find out more about celebrating the Sacrament of Baptism at St. Augustine Church, and to make arrangements for a meeting with the pastor to discuss preparation and details. Contact the Parish Office, click here.